Ann Radcliffe was born Ann Ward in Holborn, London, England and married William Radcliffe, an editor, in 1788. She published the Gothic The Castles of Athlin and Dunbayne in 1789, and the rest of her work remained in that genre. Her work was popular among the upper and middle classes, and included The Sicilian Romance (1790), The Romance of the Forest (1791), The Mysteries of Udolpho (1794), and The Italian (1796). The success of The Romance of the Forest established Radcliffe as the leading practitioner of Gothic literature, inspiring many imitations, including Jane Austen's classic Gothic satire, Northanger Abbey. Radcliffe's work also influenced Sir Walter Scott and Mary Wollstonecraft. FCIT. "Ann Radcliffe author page." Lit2Go ETC. Web. 19 April 2019. <https://etc.usf.edu/lit2go/authors/71/ann-radcliffe/>. 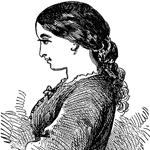 FCIT, "Ann Radcliffe author page." Accessed April 19, 2019. https://etc.usf.edu/lit2go/authors/71/ann-radcliffe/.